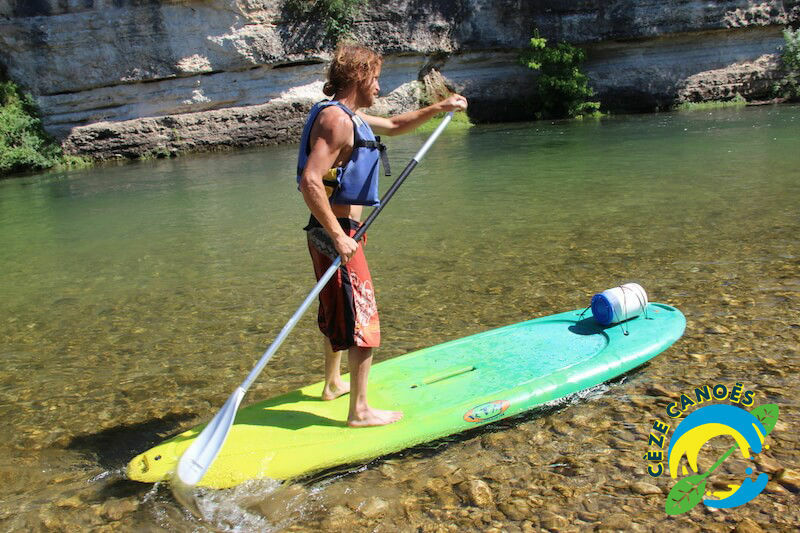 4 courses in stand-up paddle, for novices or sportsmen! Standing on your board, let yourself slide along the water and discover the river from a new angle! Paddle river is an accessible activity. More physical than canoeing, this activity will tone your muscles and awaken your senses. Take the time to discover the many beaches that are jetted. La Cèze is a wild, intimate and peaceful river that will help you relax. You can also rent the stand-up paddle on time, without transportation, you can initiate our water at the foot of our base. April-October: Meeting at the base of Goudargues, in the Village Center. Departure every 20 min, every day. Back at your convenience. June-July-August: Meet at the base of the Pont du Courau in Saint André-de-Roquepertuis. Departure every 20 min, every day. Back at your convenience. High season (July / August): between 9h and 17h. On site: ice cream parlor. Activity according to the weather conditions. Know how to swim and be 12 years old.